Rich: Dr. Mary Beth McCabe is the lead faculty in Marketing at National University, the 12th largest private, nonprofit in the United States. She is currently developing a concentration in Mobile Marketing & Social Marketing as part of the MBA program. Dr. McCabe had been an adjunct faculty at UCSD Extension at San Diego State University, and received her doctorate in Marketing from the United States International University. Her online marketing experience began in 1993, after 15 years of selling TV and producing radio programs, when she opened her own marketing firm. She has completed projects for more than 4,000 businesses, instructing more than 5,000 marketing students worldwide. She is passionate about what’s the next marketing challenge. Mary Beth, welcome to the show. Mary Beth: Well thanks, Rich, it’s really a pleasure to be here. Thank you for the invitation. Rich: It was great, we ran into each other again at Social Media Marketing World and just reconnected, and I was really excited to hear what you were talking about in class, and that’s why I invited you on the show. So let’s jump right into the questions. As I was taking a look at some of the material for your classes, when I was in college (jamming out to bands like Pearl Jam and The Grateful Dead), there was no concentration in Mobile Marketing and Social Media. In fact, come to think of it, I don’t think there was any email either. So can you give us a rundown of what the concentration is like, the types of prerequisite and what students learn when they’re done, assuming that they didn’t fall asleep in class? Mary Beth: That’s a really good point there. So the typical National University student is somebody who may not have been your traditional 4-year college right out of high school student. So most of what we’re teaching are practical applications of theories. And I would imagine that many of our students would be the typical person that’s listening to this conversation. Many of the students in my classes do own their own business or are the marketing manager for a small company, and they want to get their degree from an accredited, reliable, responsible university with a really good reputation. So they selected National – which is on a different schedule – we’re on a 1-month schedule, so each course is only 4 weeks long. This fits in with a lot of people’s time commitments. But to get really down to what you asked, was what are they learning. And to answer that I had to really figure out about 3 years ago, what was mobile marketing and how do we teach it. And then what should we call it. There were a lot of choices that I had, so I really wanted to narrow in on the mobile part, but I also knew that social was going to be important. So we call it a concentration in mobile marketing and social media. It’s a 5 course – so it’s 5 months long – and they do that as part of their MBA program so they can get their entire MBA with the mobile concentration in about 18 months. The mobile courses are using a brand new, never before seen textbook that I wrote with a couple of coauthors who are really experts in the mobile marketing industry, and that’s what we are teaching. Not just from a theoretical point of view how to actually do what needs to be done to make a business have a mobile friendly, mobile enabled, mobile useful presence, and it’s really taking off. We’re in our 2nd cohort right now, the 1st cohort completed their degrees and are out there working. Now the 2nd cohort is underway and the 3rd will be starting again this fall. So they’re small classes because we find that really works. To really narrow the answer down, Rich, they’re learning things that they can use tomorrow in their selective field of business and get a practical application right away. Rich: Alright, so you mentioned before, these are nontraditional students. They may be people just like me who have started a business or who are working in a business and they’re looking to fit mobile marketing and an MBA into their busy schedules. Very cool. And so, if I’m in that class, are these labs? Am I learning how to do mobile coding, am I learning apps or am I learning more about the strategies of how I can use mobile marketing to enhance my Agents Of Change Conference or my flyte new media company, or what? Mary Beth: The latter. So this is not a technical or coding course of study. However, what we do teach is the strategy that any business needs to know in order to survive. So we give the background of why it’s important and also the strategy of how to be successful. We are teaching on a learning platform that’s interactive, so they are taught on live chats. Wherever you are in the world you can access the course, from any corner of the world. Rich: Interesting, So you mention that you’re actually writing a book with 3 people, what are some of the other books that are part of the syllabus that you teach? Mary Beth: We use the Groundswell book, Charlene Li’s. In fact, just before we got on this conversation, I’m reviewing the social media course and we are transferring it this weekend from the e-platform, called eCollege, into the Blackboard platform, Collaborate. Which is a much more advanced and more mobile-friendly platform. So we are walking the walk along with every other business out there. We found that we needed to adapt our courses, so we’re bringing all 1800 courses at the University’s School of Business over with the last 3 months over to this new platform. The other course that I mentioned, Groundswell, we’re also using (Erik) Qualman’s book, we use Cindy Krum’s book also as a supplement to our book. We had Mobile Marketing For Dummies, which was part of the original plan to use that because Michael Becker is also teaching with us, and he’s the author of that textbook. But we’re also looking for other books, too, to supplement. We’re also looking for items that maybe some of the audience may be writing to include as part of our curriculum. We want to be the freshest, most current curriculum out there. Rich: Awesome. Well, we’ll try and create links to all the books you just mentioned. As well, if people are listening now and you’re reading a book that you think would be valuable, make sure that you drop it into the comments. So as people are moving from the real work into your classroom – maybe they’re going for their MBA – what would you say some of the misconceptions are about mobile marketing for the average entrepreneur who you’re seeing now in your classes? Mary Beth: That’s a really good question, thanks for asking. the typical student when they first get into our course they think, “ Wow, we’re going to make an app now.” And when we really sit down and talk to them about what it is they need, usually that ‘s the last thing on the list. So they need to be doing many more things before they get to the step of making an app. So that’s the first misconception. But thanks, that was a really good question, Rich. Rich: Alright, well good. Thank you. So if that’s not where we want to start, where do you think most entrepreneurs should be starting as they’re developing their mobile marketing campaigns and strategies? Mary Beth: What they need to start with is their consumer marketing. Who is their audience? There is a prerequisite for the course and it’s an intro to marketing, it’s a marketing management class. We use the (Phil) Kotler book, which a lot of people may know of. It’s kind of a doorstop, but we do use the most current version, and they do keep it up to date. But the point is, coming to our program, you really have a basic understanding of marketing. And we want you to continue that by focusing on your customer. And the same things that you learn in the basic courses, we continue to build upon here. And those include marketing research and marketing social and the real basics of marketing strategy that we need to identify – such as a “SWOT analysis” – where are our strengths and weaknesses, where are opportunities and threads. As they build their consumer knowledge they will realize what elements of mobile their customers are actually using. So that’s why I’m saying they may not need to have an app, maybe they connect with their mobile customers in other manners initially, before they consider what else they need to do. Rich: So give me some examples. What are some ways that you think that entrepreneurs and small businesses should consider as ways that they can engage their audience through mobile? Mary Beth: Well, I think one thing that people are not doing enough of right now is video. And I see video as a real underused tool. So there are a number of platforms that you can post our videos and make them mobile enabled and promote those as ways to connect with audiences. Just as examples we know that YouTube is the #2 search engine. But are you as a small business and someone who’s wanting to learn more about digital marketing, are you using YouTube in the ways that your audiences on the go can connect? Things like “click to call” on your website, these are some real basics that are being overlooked. And just to put that into perspective, just this week I’m getting my mobile website up to speed, so not everyone has got theirs done yet. You’ve got to be responsive. Rich: We’re obviously big proponents of mobile friendly websites, and I often field calls all the time, “Will you do a mobile app for me?” And we don’t do mobile apps within my company, but very often I ask people and get to the bottom of it, and it turns out there’s no need for them to spend all that money on a mobile app when their website is either already mobile or could be made mobile for a fraction of the cost and will have a much better reach than a mobile app ever will. So there’s a lot of ways that people can start small with a mobile website. I love the video idea, I think that’s great. We use video here at flyte – not as much as we should – but I also like the idea of the “click to call”, and one of the easiest things to do is just to make sure that you don’t have pictures of your phone number on your website, you actually have the html text. Which then on most devices make it a clickable number that then people can call you. Mary Beth: Can I give you an example of a guest speaker that we had recently? Rich: I would love it, yes. Mary Beth: We had Michael Ahearne, who’s the head of Waterfall, one of the top SMS companies, they’re one of the best ones out there. He came on and did a guest lecture, live, with our students and gave us a perspective from a practical point of view of how companies can be using SMS. And the students in the class got to practice live and see how things worked from a business perspective and how easy it was for them to really create that SMS campaign idea. And that’s a tool of mobile marketing that so few businesses are using. Rich: So do you remember any of the specific examples of the students in the class and how they were using that during the lecture? Or perhaps another example that Mr. Ahearn brought up that you could site for us? I think for a lot of people who listen, they know what SMS marketing is but they don’t really know how it all works. Mary Beth: One of the things that I can just remember off the top of my head is a contest. So you can create a very rich media contest using SMS campaigns, and you have instant credibility, instant access to this pool of your most avid customers. So there’s a certain percentage of people who are just going to look at your website, then there’s a certain percentage of people who might engage with you, and then there’s the core customer. Those are the people who are really going to be valuable for your CRM down the road, and engaging with them in an SMS manner. And we of course teach the ethics of mobile marketing in our courses, in the first week. One example I’ll give you is a Domino’s Pizza in the area had 1 day last July where you couldn’t call in for a pizza, you could only send via a mobile app. So that was the only way that you could order a pizza that day. And they had a special offer and they were very, very successful. So some companies might want to try that as a chance to engage with their customers who some are mobile only these days. Rich: That’s interesting, And also, for the rest of the people, you’re also training people to use your app or text messaging or whatever it might be. Mary Beth: That’s right. So when I mentioned ethics before, I really want to stress that one of the things you get with an academic program – more so than you would on a typical 1-hour webinar – is we go in depth. We go deep because we know that everybody’s had a chance to learn something. We dive beneath the surface and discuss ethical issues that do come up with regards to the technology, and those include privacy and security and just being good stewards of the industry. Rich: Very cool. So one of the things that I was wondering when I was listening to you talk about your students, obviously mobile and social are changing so much dramatically and quickly, how do you balance teaching them about what’s going on today versus teaching evergreen tactics when it comes to these mason technologies. What is the balance there and how do you put them in a position where they can go off into the real world and succeed? Mary Beth: That is always going to be a struggle. I haven’t found the perfect balance, but I am looking at it closely. I know that they’re best suited to have the tools that they can use tomorrow, but I’d also like them to know this fits into the role of business, the role of what they’re going to be doing 5 years from now. And maybe they’ll be the CEO of a company by that time and what will they need to know now that they can use later. I haven’t got the perfect balance, but I’m always giving them something new at the very beginning of class. And out classes are only a 2 hour chat, the rest of the course is in discussion boards, in assignments, in group projects that they work on, and we often use case studies and we also some short quizzes and things like that. Now in the social media course – just to take off on that a little bit – they do have to create their own Twitter page, they do have to create a blog, they do have to create a Facebook page for their business. They have to do these in the course itself and they have to show the instructor what they’ve created. And at the conclusion of the 5 courses, they actually put together a mobile and social marketing plan, and they present it to their classmates and professor and if they work for a company they can bring in their CEO and have them listen to the presentation. Rich: Oh, that’s interesting, Then they actually walk away with something tangible that they can put to use in the real world. Mary Beth: That’s exactly right. And I’ll give you one example, one of our students in our first cohort worked (and still works) for National University, and she took her program and her project and applied it to a university that we own and she did her project on that University, and now she’s still doing that project for her job. Another student works for a company called, Metropolis, and they are a pet grooming business in Solana Beach, California, and she did her project on the retail store. A year later and she’s still applying the things she learned. We brought her back and she did some testimonials that will be posted on YouTube shortly, just to reinforce what she’s learned. So whether it’s a large university or a pet store, these examples are coming out. Rich: It’s good to see that the students are putting this to good use. So what marketing organizations do you think are doing a good job of educating future marketers outside of your university? Mary Beth: Well, I have to talk a little bit about The American Marketing Association. I’ve been involved in their collegiate relations program and there are 350 universities that have a chapter. It is a great feeding ground for the professional chapter. They are supporting those students at the local level in a big way by giving mentorship, by giving scholarship, by giving hands on, practical experiences at a reduced cost or no cost. This is really exciting to me, so I just wanted to point out that if someone’s listening here and they happen to be a student – no matter what part of the country or in Mexico – there’s a local American Marketing Association in your area, and there’s likely a student chapter that you could join, and it’s transferable to whatever sity that you might move to. So the idea is you would have this on your resume when you’re going out there seeking that next job and you can talk about whatever experiences or internships or mentors you were able to develop during that time period. We have a conference coming up on May 8th that’s all about “Causes” and the American Marketing Association is sponsoring it and it’s all nonprofit organizations, which many in your audience might belong to that group of business owners. Rich: That sounds great. And we’ll have any links that you want to share with us, probably the May 8th date will be behind us by the time we launch this, but if you have any resources we’ll be happy to share those as well. A quick question, is The Marketing Agents Podcast yet a part of the curriculum over at your social and mobile marketing class? Mary Beth: Rich, that’s making me smile. At the Social Media Marketing World Conference, I sat down with a lot of the podcasters and got coached and mentored and I created my first 3 podcasts during that conference. I really think this will be the next part of our curriculum and I am ready to introduce it. I think this is a key learning experience for our students as well as small business digital marketers.You have a proponent here of getting out there and sharing your knowledge in bite size pieces so that you can develop a following. Rich: Alright, sounds good. Now listen, where can we learn more about you, your course or anything else you’d like to share online? Mary Beth: Well, our university is the 12th largest private non-profit in the United States, our website is nu.edu. You might know a graduate already, there’s 150,000. I personally started Sun Marketing in 1993, my first clients were advertising with banner ads. So Sun Marketing has transitioned to kind of a hispanic-focused marketing agency, but we also do a lot of mobile and some other things. As I mentioned, my website is just today being transformed, and I’d love any feedback. So if you’re listening to this in May about this time, it should be looking better. So please let me know. It’s sunmarketing.net. And you can reach out to me on LinkedIn or Facebook or Twitter or YouTube or any other platform. One of the newer platforms I’m having fun with right now is Periscope. I’ll share with you that that’s something I’m going to be teaching the students to do livestreaming as well as the podcasting, which you mentioned. Rich: Ok, that is some great stuff. I look forward to checking you out on Periscope and all of those other place. We’ll have all those links in the show notes. Mary Beth, thank you very much for your time today. Mary Beth: Rich, its been a pleasure. Thanks so much for letting me share what students need to know in order to survive. And not only students, we’re all students in this world today. Thanks. Want to interview Rich on The Marketing Agents Podcast episode 100? Let me know! Grab your early bird ticket to The Agents of Change Digital Marketing Conference Now! To find out more about National University, where Mary Beth teaches, check out their website. 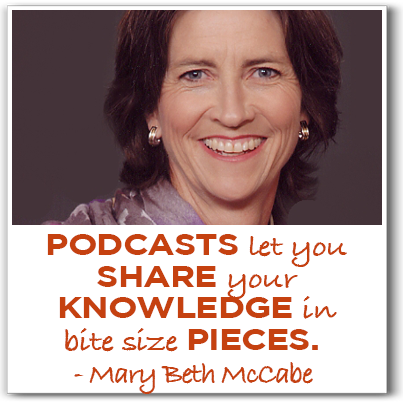 You can follow Mary Beth on Twitter, LinkedIn, YouTube and Facebook. You can also check out the newly updated webpage for Mary Beth’s marketing company. She’d love to hear your feedback on the new site! Interested in learning more about the American Marketing Association, or in becoming a member? Check out their website. This entry was posted in Mobile Marketing, Social Media Marketing and tagged Dr. Mary Beth McCabe, mobile marketing, social media by Rich Brooks. Bookmark the permalink.